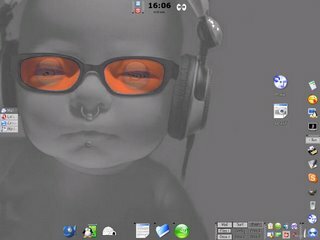 You know that, maybe, Linux systems allows you to have several desktops - that is why you see my three DeskShots instad of one: Yes, I have three wallpapers that actually covers 9 virtual desktops. I find this way more usefull that the cramped TrayBar in Xp, where past 10 things opened at the same time you can't spot what's what anymore. My Virtual Desks are Mails, Surf, Bash (for command Line Nightmares), Files 1, Configs, Files 2 and Docs 1, 2 a,d 3. ut nothing forces me into using them like this, you can actually open anything anywhere. Still, my permanently opened Email and FlashDrive browser are open all the time, somewhere a click away, whatever the mess on the screen. A nice feature, really.